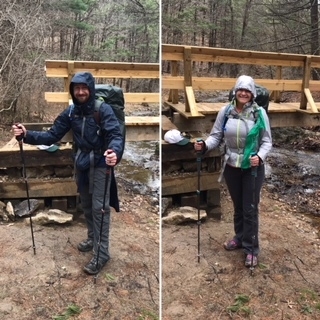 Our short-lived Spring Break was spent doing our first official “shakedown” hike in preparation for the Colorado Trail this summer. 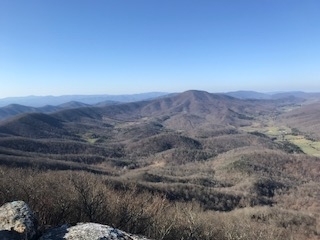 We hiked about 36 miles on Virginia’s Triple Crown Loop which covers about 28 miles of the Appalachian Trail and hits the well known highlights of Dragon’s Tooth, McAfee Knob, and Tinker Cliffs. On Wednesday afternoon we drove about 9 hours to Beckley, WV and stayed overnight. The next morning, we rearranged our backpacks, dressed in our hiking gear, and drove the remaining two hours to the Andy Layne Trail parking lot and starting hiking south around 10am on Thursday. 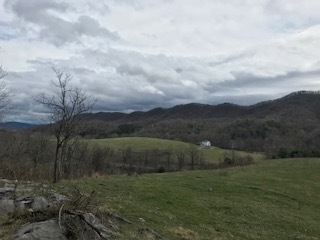 We started on the Catawba Valley Trail that connects to the North Mountain Trail after about 2.5 miles. That included a few shallow creek crossings and a lot of uphill climbs. We followed the North Mountain Trail the rest of the day and finally reached VA 311 and saw the Dragon’s Tooth Parking Lot. After another 0.2 miles, we arrived at the intersection of the Boy Scout and Dragon’s Tooth Trail. 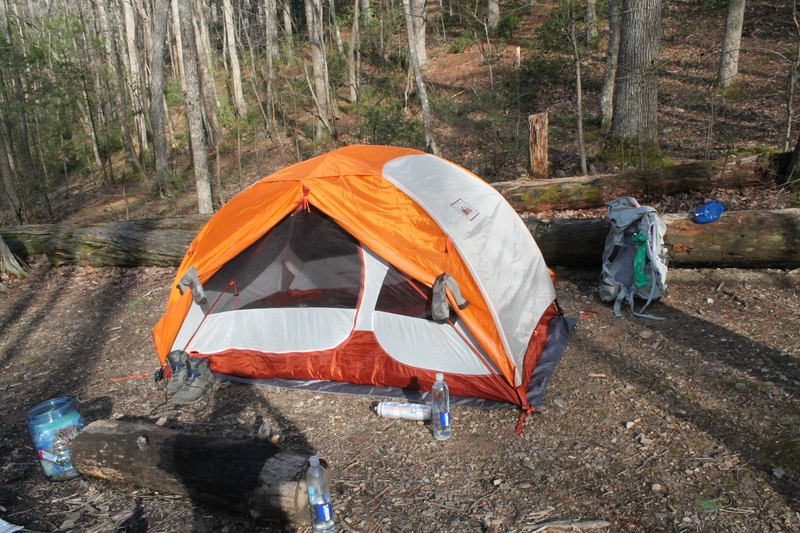 We set up camp next to the creek which made for some peaceful background noise for sleeping. Rain was expected, so we put up our rain fly, ate dinner, and crawled into bed after Jon failed to start a fire with all the wet brush and wood we encountered. It rained overnight for a short time, and our tent did get a little wet…we mistakenly had our footprint sticking out uphill which allowed some water to seep in. Woops! Lesson learned there. On Friday, we broke camp in under an hour and started hiking around 8am for about 1.5 miles to our first Appalachian Trail White Blaze! We turned right and started up Dragon’s Tooth. What a tough hike. I would be lying if I said every step of that hike didn’t make me rethink this whole backpacking thing. The dogs were almost impossible to lead up the rocks and we ended up lifting them up in a few places. By the time we got to the iron rungs, we knew we couldn’t safely keep hiking with the dogs. Jon dropped his pack and hiked up to Dragon’s Tooth alone while I stayed with the dogs and then we switched. Then we had the pleasure of hiking down Dragon’s Tooth to continue with our day. Thankfully, no one was hurt but we both slipped on some wet rocks or were pulled off balance by our over excited pups. We arrived back at Lost Spectacles Gap and continued North on the AT as it started to rain. I wanted to cry, but my husband smiled because we were able to test out our rain gear. Thankfully, it worked, but the dogs were cold and wet and shivering any time we stopped for a few seconds. The rain stopped after about 30 minutes and we came to our second road crossing and continued to climb up and up and up on the AT. All decked out in our rain gear! Then we came to one of my favorite parts of the whole hike, the cow pasture! If the dogs hadn’t been howling at the cows and making them scurry, I may have enjoyed it even more. Shortly after, we crossed VA 311 again at McAfee Knob Parking Lot and continued hiking until reaching Catawba campsite around 4:30pm. Jon offered to hike back about two tenths of a mile to filter all our water at the creek while I set up camp. This system seems to work great for us. Friday. Was. Cold. We struggled to keep warm cooking our food Friday evening. I even broke out my “emergency” hand warmers for my feet. My sleeping bag was zipped up as far as it would go and cinched down the head piece. Surprisingly, I warmed up pretty quickly and had a darn good night’s sleep. Jon, on the other hand, did not. The dogs were shivering and did not want to sleep on the ground. They worked hard to get onto our sleeping pads or on top of us for warmth. We had talked about bringing a portion of a foldable sleeping pad for them, but they move around so much at night so we didn’t think it would be worth it. Jon slept pretty uncomfortable all night trying to accommodate the dogs on his sleeping pad and even in his sleeping bag at one point. He was not a happy hiker when he woke up the next morning! And the next morning was COLD. I forgot my ear warmer and gloves which made breaking down the tent pretty painful. Another mistake…noted! Saturday, we woke up around 4:30am to hike the 1.5 miles up to McAfee Knob to catch the sunrise. We arrived around 6:30am for the 7am sunrise, stood there for about 15 minutes and felt miserably cold. After a couple quick pictures, we decided to move on with our hike to start warming up. Around 9:30am we arrived at Tinker Cliffs and stopped for a snack, but again, starting feeling the cold pretty intensely when we weren’t moving around. We reached the end of our white blazes and turned to follow the Andy Layne Trail 3.1 miles back to our car. Our packs were fitting great, no back pain for either of us. We were consistently hiking about 2 miles per hour. Food-wise, we packed exactly the amount of food we needed, with the exception of some leftover nuts. Our system of me setting up camp and starting dinner while Jon filters water worked great. In the morning, Jon would fetch the bear canister while I packed up our sleeping bags and pads. One small change we plan on making is purchasing a sleeping bag liner for each of us. I noticed that I could feel the cold ground through my sleeping pad and bag JUST ENOUGH to be annoying. Hopefully adding a liner will increase the warmth and I won’t have to use emergency hand warmers to get me through the night. The dogs. I hate to say it, but they did not make this already difficult endeavor any easier. You may be thinking…”DUH!” But we really hoped to bring them along and have the pros outweigh the cons. They love the outdoors, but they follow their noses the majority of the time, not our commands. When we correct them, they usually obey, but again, that is so much added energy to correct a dog while carry 30 lbs on your back, two trekking poles in your hands, and trying to forget how bad your legs hurt. After much deliberation, we decided the dogs will not be coming with us to Colorado. I am struggling to believe in my ability to do this hike, let alone if my two puppies can. We worried about their hydration, if they were too cold. We had to stop when they stopped and go when they go. It was just too much. I think Buster and Izzy will be just as happy chasing birds at home and getting loved on by my sisters who have graciously agreed to stay at our house while we are gone. We are definitely pleased with our roughly 36 mile shakedown hike and feel more prepared to take on the Colorado Trail. We have another shakedown planned on the Knobstone Trail in Indiana in a couple months. Hopefully we can work out the remaining kinks to get us ready for our late June start date!